This cheesy family-favourite one-dish meal is a cinch to make and provides an excellent source of vitamin A.
Cook Macaroni in large saucepan as directed on package, adding the vegetables to the boiling water along with the macaroni. Drain; return to pan. Add Cheese Sauce Mix and remaining ingredients; mix well. Reduce heat to low; cook 1 to 2 min. or until heated through, stirring occasionally. 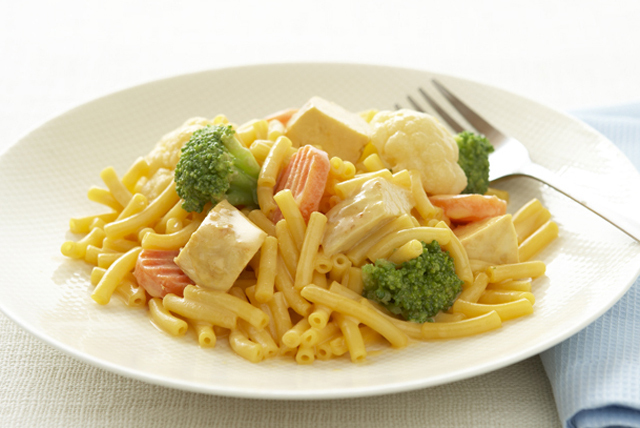 Let the kids choose their favourite vegetables to use in this cheesy dinner! The mixed vegetables in this quick-and-easy main dish are an excellent source of vitamin A.